I recently learned about and started getting into Bullet Journaling (created by Ryder Carroll). I learned about it first from Kara Benz, also known as Boho Berry, before I did some background research on the original Bullet Journal website. I started reading Kara’s Blog, watching her Videos and following her on Instagram and decided to give it a try. I was inspired to be creative in both big and seemingly small ways. 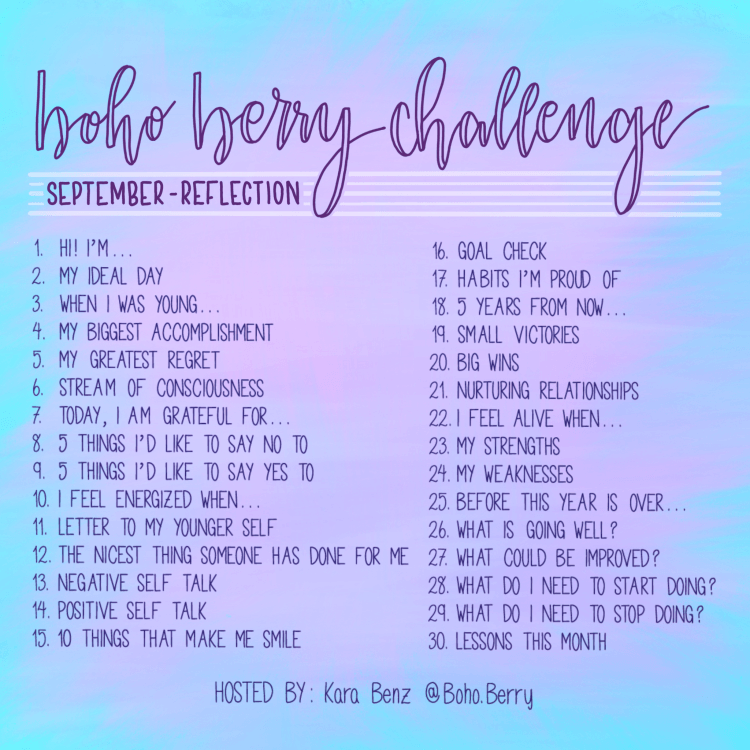 One of the things Kara does is hosts a monthly “challenge” called #BohoBerryChallenge. She “challenges” (invites) participants to share things, with a community of others, different things using the hashtag #BohoBerryChallenge on social media. Every month is a different theme, and this month’s theme is reflection. I love this theme, because we often don’t get the chance to slow down long enough to reflect on things in our lives or on our minds. This challenge can give many of us the chance to stop, think (using Kara’s prompts) and share with others. Love it! Today (Sept 1, when I wrote this) is day 1. Above is my “Hi! I’m…” pic! Visit Boho Berry to join!